When you plant open-pollinated seeds and save the seeds from that crop, the next generation is going to be like the one before. When a seed regenerates over and over for many years and remains unchanged, or stabilized, it’s then called an “heirloom” variety. How old are heirloom varieties? There are some disagreements over the age at which an open-pollinated variety should be categorized as “heirloom”. Some say that 25 years is adequate while others insist that the minimum age should be 50 years or older, assuring that they’ve stabilized. Some people even say 100 years or older. Hybrids are created by cross-pollination of varieties to produce a seed with the most desirable traits. They are typically created by large companies with different goals. Hybrid seed manufacturers want something that transports well and looks ‘pretty’ on a grocery store shelf. The thing is, when you breed for those purposes, you may lose other traits, such as flavor, and the ability to reproduce from the crop’s seed. Owners of large farms typically don’t buy heirloom seeds. Instead they are often purchased by small-scale, home gardeners and preppers who want those original traits, and the ability to save seeds for the next season – a renewable food resource. The use of heirloom varieties also bring on the nostalgia of growing what your grandparents once grew – the recollection of such good flavor. Most varieties of vegetables at grocery stores are hybrids bred to have long shelf life and tough skins for hardier transportation purposes. They also are bred to have regular shapes for attractiveness – again often at the expense of flavor (and any other yet unknown detrimental effects of hybrid or GMO). These days, heirloom varieties are trending in the produce aisles of major supermarket chains across the country, indicating the increasing concern that people have regarding the vegetables that they eat. If you are a gardener or prepper, heirloom seeds and heirloom vegetable varieties are a highly economical choice since in theory you only need to buy the seed once. You may purchase a packet of seeds, grow them and allow some of the plants to bolt to seed – for next year. Having said all this, it is true that hybrid seed-plants may be easier to grow in some cases because of the disease tolerance that may also be bred into them. Heirloom varieties may require more attention to best-practices while gardening and catching any potential problems early – as they do not have any special disease tolerance other than their natural ability to deal with a given environment. The rewards though are great. Natural food, excellent flavor, and self-sustaining. Presently, I have growing in the garden, Amish Paste, Brandywine, Pineapple, New Yorker, Morgage Lifter, & Rutgers. I probably have 35-40 extra plants? These I sometimes sell or give to friends. I have seed of many others amd more of the same from years past in my collection of seeds. I have never had seed not germinate? And I love the process of growing my plants. My wife makes juice from all the tomatoes, even though some are better than others. It is so much sweeter, don’t know why. We have tomatoes all season, sliced tomatoes at every meal. My #1 hobby and I can eat all my accomplishments. This year I made sure my entire garden is heirloom. I have 33 different types of vegetables, tubers, herbs and fruits. Heirloom seeds are a little more expensive for the initial purchase but then you only have to buy them once and can save the seeds for next year which is what we are doing. Just remember that since they are open polinators then you have to keep one variety of each or they can cross polinate and you can yourself end up with hybrids seeds. Happy gardening!!!! Thanks for mentioning that open pollinators can themselves cross pollinate, so if you had several tomato heirloom varieties growing in the garden at the same time for example, the follow-on seeds could produce a hybrid of their own the following season… which may or may not be of major importance depending on what you’re trying to accomplish. If you cross two heirlooms to create a hybrid, you can expect to see considerable diversity in the progeny. In general, the more diverse the parents, the wider the range of characteristics you can expect in the offspring, and the genetics of the offspring will generally not be stable right away. It typically takes three to ten generations to stabilize a hybrid into a new open pollinated variety, and every year you have to select plants exhibiting the traits you are looking for and save seed only from them. It’s quite fun to do actually. It has taken me ten years to stabilize an accidental cross of sequoia and midnight black turtle beans. It all started with just a few bean pods on a sequoia plant I was saving seed from that had an orange and purple speckled appearance instead of the beige color to be expected from sequoia. I now have a beautiful purple and white speckled soup bean. From that same handful of accidental hybrid seed, I also have in the making a black and silver speckled, brown and beige, tan and beige, solid black (but much larger than midnight black turtle), and a totally mixed up bean with 4 or 5 speckled colors all mixed together (this last one shows no sign of stabilizing – I get different color offshoots every year from these with only 10% or so looking like the original parent – with bean genetics that is sometimes the case). As to saving seed from commercial hybrids, you can try it, but just like I’ve mentioned above for hybrids of heirlooms, you might see a range of characteristics in the offspring. I have not generally found the offspring to be weaker. In fact in some cases I’ve found all the offspring to look just like the hybrid parent, making me question if it was a hybrid at all or just an open-pollinated variety being sold as a hybrid to discourage seed saving and to justify a higher price for the seed. Lilac hybrid pepper is one example. Once in awhile, seeds from commercial hybrid plants are sterile, but it tends to be the exception, at leasts in my experience. Is there any non-hybrid corn left on earth? anyway, heirlooms will generally produce good viable true to variety seed.You asked this to be able to save seed correct? For year to year eating I love all the newest varieties like Serendipity or the newest and sweetest longest keeping wow Mirai and I plant them. But if you need to replant seed you have grown these wont work. Sweet corn is just hybrid field corn that was bred from sweeter than normal feed corn and originally was only used to feed cattle!And then just crossed and recrossed to get what we have today, Candy sweet deliciousness!!! Anyway, 2 varieties that I am sure of are Golden Bantam(70-85 days) and Silver queen(92 days).I believe any SU variety sweetcorn is stable enough to save seed from, but there may be some that are not. I just bought 4 pounds of early Golden Bantam sweet corn which is an open pollinator to put back for long term storage.Its not nearly as sweet as the newest triple sweets out there, but can be replanted endlessly if needs be,and was really cheap by the pound(8 bucks I think). I do believe Silver Queen also is an heirloom that can be used as a shtf crop and its seed saved,but is best for southern locations. I have never had much luck growing a decent stand of silver queen here as far north as I am without really good luck from mother nature because it has such a long growing time. I figure I will want a short season corn like bantam if times are rough. Actually, there are plenty of non-hybrid seed (mostly in 3rd world countries). But we’re working on killing it. That was one of the things we completely eliminated from Iraq when we invaded, we made it illegal for them to keep their own seed, and required them to purchase it from our major food corporations. We’re down about 75% of the varieties of crops that used to exist 100 years ago. There are seed trading sites. And, you could always hit up your fellow preppers to swap some seeds. I’d ‘lose’ them amongst the packing for a book, sent media-mail USPS. Get a book, as well as free seeds. You can get heirloom seeds and plants in the US. They tend to cost more, might perform less. Seeds, I get online. Freeze them. Tomato plants I get at a local nursery. The nursery had six or seven varieties. I got three. The biggest issue I have with heirloom tomatoes is that they take a month more to produce. Not great in the North. oh , and the original non hybrid corn was from south america and was nothing more than grass till it’s original hybridizer, the Inca and Mayan Indians started growing and cross pollinating it. Tomatoes are self pollinators. They do not need insects to pollinate. To keep your variety from cross pollinating, use distance, bloom time, physical barriers, & etc. Personally, I haven’t seen any cross pollination in my tomatoes even though they are planted in the same garden. I wouldn’t mind if they did cross, if they produced hardy, large-to-medium, sweet tomatos. I don’t sell seed. Have your heard the term “look it up” or “write it down”? Its for people who don’t believe or can’t remember. Some tomatoes are better doing it than others. Speaking of bees, they are scarce here this year. I have a new hive and two capture boxes if any come by for a visit. Long ago, a group of monks got into a discussion of horses teeth. How many did a horse have? All the ancient writings were consulted, and the discussion became more and more heated. Finally a young monk suggested they look in the horse’s mouth. One and all turned on this impertinent, irreverent monk and they literally threw him out of the monastery. At risk of being thrown out of tomato groups, I will try to inject some common sense into the tomato pollination discussion. It’s funny how often it’s said that tomatoes self pollinate, but always in the context of ways to help them self pollinate, or reasons why they didn’t self pollinate. Oxymoronish isn’t it? The best pollinator for tomatoes is the original, a bee which “sonicated” at the resonant frequency of the flower. Sonication, also called buzz pollination is when the bee vibrates its wing muscles but doesn’t fly; it just hangs on. The reason is that tomato pollen is not in the exterior of the anthers like most flowers, rather it is produced internally and then released thru pores in the anther. Motion is required to release the pollen, and the greatest quantity is released by sonication of the correct frequency. However other bees with different frequency, or even shaking by wind will release some pollen. There are a couple problems: one is that the natural pollinator (a wild bee) didn’t travel with the tomato as it was spread throughout the world. The other is that the flower is not very attractive to other bees, and when bee populations are low the tomato generally gets ignored. Bumblebees are the most often seen on tomatoes, though honeybees, when hungry enough will also work them, as will some solitary bees. Did you ever watch a bumblebee work a tomato blossom? When it does, it pulls the flower down into a vertical position, puts its fat belly against the stigma, and buzzes. The pollen that is released, now will fall by gravity (since the flower is now tilting down) directly to the bee’s fuzzy (and statically charged) belly, which is rubbing against the sticky stigma as it vibrates. Tomatoes are self fertile, but the pollen can come from any other tomato that the bee has visited, a bane for seed growers who want to keep varieties pure, but lovely for the gardener who wants fruit. The size of the fruit is dependent on the number of ovules fertilized, up to the 100% mark. In other words, the more seeds, the meatier the ‘mater. So we want to get pollination as full as possible. This is the reason the bee is best, it delivers the most grains of pollen, exactly where it is needed, on the sticky surface of the stigma. When shaking is done by hand, think about mimicking the natural resonances of sonicating bees. Shaking should not be violent, just as close to the right frequency as possible. Electric vibrators were long used in greenhouses for tomatoes, but have been replaced, as bumblebees are found to be far more efficient. Using an artist brush with tomatoes is very inefficient because the pollen is not on the surface. Yup, tomatoes are self fertile, but self pollinating?…only when conditions are ideal…they often need help. “Self pollinating” is one of the myths of tomato growers. Just because you think you worked in a greenhouse since 1978, doesn’t mean you know everything! I too, can just act like an expert and spout off good tidings. Wrong! Tomatoes pollinate just fine without insects. So do peas, all cultivated pepper varieties, eggplants, basil, lettuce and the common bean (p. vulgaris), to name just a few self-pollinators. However, persistent bees sometimes managage to force some flowers open before the pollen has been shed, which leads to those accidental hybrids. You can find other isolation distance tables on the internet. The recommended distances vary greatly. A simple explanation of tomato pollination, please? Most plants in the wild are self sterile, ie. Nature dislikes incestuous propagation and prefers cross pollination, where the pollen is transferred between two genetically different plants. Cross pollination is achieved for most vegetables by an agent (called a pollinator), that physically moves the pollen. Usually this is a bee, because they are specially equipped to efficiently carry pollen; they are brawny, fuzzy, and have a static charge, so they acquire and transfer many grains of pollen. In the case of the tomato, mankind has (perhaps unwittingly) selected plants with the defect of being self fertile. This likely came about as the plant was moved from its native area to other parts of the world without moving the native pollinators that were best equipped to cross pollinate them. So the surviving strains were the ones that had this defect. Looking at cross pollination from the point of view of the fruit grower is utterly different from the point of view of the seed grower. With most plants, good cross pollination is very much desired, in some cases to make fruit at all, and in other cases to cause better quality fruit. Of course uncontrolled cross pollination makes the seed grower nuts, as he cannot predict exactly the characteristics of the plants grown from the seed. Tomatoes are kind of a dream plant that can function both for the fruit grower and the seed producer. The reason is that they exhibit little “inbreeding depression.” That is, most plants, if they have any self fertility at all, will grow puny fruit and poor quality seed. Tomatoes can be self fertilized and still be fairly vigorous. In a discussion like this, someone always pipes up with the claim that tomatoes are “self pollinating.” This is a myth. Remember that myths are half truths. Most of the time, when you hear the myth, it is, of course, in the context of why tomatoes AREN’T self pollinating. Odd, isn’t it? Most flowers have anthers (the male organ) that have the pollen on the outside. Anything that brushes the anther is likely to pick up some pollen. Tomato anthers are different; they are hollow tubes with the pollen grains inside. They are not released to the touch. The tomato must have help. It requires MOTION to release the pollen. Wind can accomplish this to some extent. Pollen grains are shaken loose and may land on the sticky stigma, thus accomplishing fertilization of some of the seeds. Note that this is not self pollination, as the tomato could not do this of itself. You can hand pollinate tomatoes by using any means of shaking the blossoms that doesn’t break plant parts. You can tap on the stem below the flower cluster with a pencil. Or you can hold an electric toothbrush against the stem. But the best tomato pollinator is a bee that “sonicates” or “buzz pollinates” the flower. Bees, most often bumblebees in eastern USA, will land on the flower, pulling it down until the anther is vertical (thus getting gravity’s help) and then vibrating their wing muscles (and their entire bodies) to shake loose the pollen. The vibration causes the flower to resonate, and many grains of pollen are shaken loose. This drops onto the bee’s belly, which is also vibrating. Some of it will stick to the bee and be available for cross pollination when she visits a flower on another plant. Much of it will bounce right back up to the sticky stigma. The development of the fleshy part of the fruit is stimulated by the fertilization of the seeds. Pollen grains on the stigma grow pollen tubes to the incipient seeds and fertilize them. If only a few grains of pollen are delivered, a fruit may form, but will not size up. When enough grains of pollen are delivered to fertilize most of the incipient seeds, the fruit will be all that it can be. If you are growing tomatoes for fruit, and not for seed saving, cross pollination is not of much concern to you. You just want good pollination to get the most and best fruit possible. If you are growing tomatoes for seed, then you want to control the pollination more carefully. Generally, a gardener who saves seeds would want to keep an open pollinated variety pure, so you seek means to isolate the plants. This can be done by excluding bees (cages around plant or flowers), by sufficient distance between plants, or by timing bloom at different times. Some tomato varieties are even nicer to the seed grower. The pollen is viable, even before the flower opens. If the flower gets sufficient motion (one reason why gardeners intuitively love early morning thunderstorms), it’s possible for the seeds to be fully fertilized quickly and keeping cross pollination down to a bare minimum. Oh,Seedsaver, and all those other plants you just listed also most DEFINITELY need pollinators to produce well.Especially beans, peas, and peppers, That’s why farmers spend thousands of dollars every year hiring apiaries to come to their fields to pollinate their crops. Instead of just proclaiming wrong! why dont you ask why do I think they do need pollinators and maybe learn something new? Do you understand the difference between self fertile and self pollinating? (I gather you don’t). Many fruit tree varieties are not self fertile and need another variety to produce a good crop. Same as many vegetables. Tomatoes are different and are self fertile which means they will produce well without another variety to cross with. Their pollen can fertilize their own flowers and produce a good un stunted crop. But in all cases they still need a vehicle (pollenator) to do the pollinating, no matter if self fertile or not. Corn on the other hand can and does “self pollinate”. even though bees love corn pollen, and It is one of the reason’s I think they are suffering, because of all the gmo’s and chemicals sprayed on the corn that they eat and bring back to the hive. Ahh, you seem to think that if your tomatoes cross you will get new varieties right on that vine that season. The cross would only effect the seed and the resulting next generation of fruit when you plant that seed. It’s why you need to have at least one other variety of apple tree to cross with, to get a full crop. The fruit farmers dont care about the seed in the crossed apples, only the large, hardy crop produced.Its why they dont grow apple trees for production from seed and just clone the great trait-ed tree over and over and graft them on wild root stock. Seed growers, on the other hand, just like breeders of dogs, cross the same variety over and over and select the parents that show promising traits they want to encourage. Seed producers almost never rely on distance or some other random barrier because they could never be 100% sure there was no other pollen introduced.But unfortunately, just like dog breeders, once you have crossed and recrosses the same parent plants for multiple generations you start getting bad traits along with the good ones. In dogs you get hip displasia in pure breed collies, or bad temperament in Dalmatians or some other birth defect along with the “perfect” coat or head size.And in fruits or flower or vegetables you get big fruits but, low taste, or lots of early fruit that splits or has some other not so welcome trait…also why mutts are so hardy and healthy and wild crossed flowers, apples,vegetables taste so good and are naturally disease resistant and vigorous. Last season I did three different varieties of tomato. Much to my surprise they cross pollinated. Different characteristics than expected. Perhaps not a new ‘variety on the vine’. But certainly different. EH, then that was not pure bred plants or seed you bought or was, and was just not the variety claimed on the pack.Once a seed is planted and the plant is grown it will not produce hybred crossed tomatoes in that generation on that vine, only the next when Those seeds are planted and grown. I have many times planted multiple flats of flowers only to find out they are definitely not the variety that was claimed on the label once grown out. I have also planted many times bush beans that are runner beans. I conclude either they got pollen cross contaminated during growing season at the seed breeders or wrong seed mixed in together in the pack, or mislabeled altogether. I don’t grow tomatoes from seed. The plants definitely cross bread. I didn’t see any point in saving seeds. Oh and one more thing, bees can cross pollinate between two or more …say, Roma tomato plants in your garden and if that’s the only kind you planted, you would not notice any change when you replanted those seeds the next year. But, rest assured they “cross pollinated” by bumble or mason bees most likely. TADA!!! you have now just become a hybredizer!!! Or you can cross between two totally separate varieties like roma and Rutgers(just an example, have no idea if those will cross or not) and get some weird crosses,I know lots of times I will get volunteers from cherry or pear tomatoes that are some real goof balls and totally different from last years plants.All those new crosses, like different colors, shapes and changes you WILL notice. TADA again!!! now you have made a new variety. If its really great sell it to burpee for a bunch of money. All your peas and beans cross pollinate in your garden every year too but, unlike tomatoes,they MUST cross with other plants to get a good crop. Experiment and plant only one pea plant (in isolation) and see how many peas you get.If you have neighbors that also plant peas or grow sweet peas no fair you will still get plenty. or moths or whatever pollinator you have in your area. Dont believe me? grow a tomato plant indoors away from those busy bodies and see how many tomatoes you get.You will get flowers but they will go un pollinated without help. Anybody used Mason bees? Seems like a good idea. Looking for insight. I grow several varieties of Pear tomatoes every year. 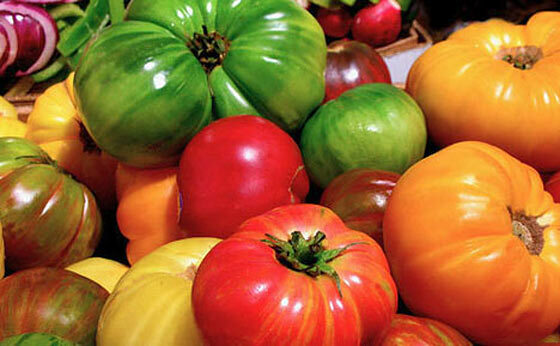 They are all heirloom, open pollinated varieties. They cross with each other like mad! But I like the surprise I get each year out of these. They are always, sweet and tasty, just different colors, sizes and sometimes shapes. All my other fruit and veggie seeds I plant with NOT letting them cross in mind. For instance; corn, if you want sweet corn and flour corn growing the same year, you better separate them by at least 150′, or you’ll have inedible corn from the seed that results since corn is wind pollinated. You need to research each variety, finding out how they are pollinated, bloom time, and ripening time to keep pure seed pure. I have Four O’Clock seed that I obtained from my Grandma’s flower garden when I was a kid and have grown out each year since. Those are truly Heirlooms in that they have been passed down in my family for generations. Just recently I read that this variety (Broken Colors) was a hair’s breadth from becoming extinct! When you say broken colors, do you mean that different colors grow on the same plant? Or something like varigated? Or just a name of the variety? My cousin grows four-o’clocks that has the couple colors on the same plant. I planted a few of those seed. “Broken Colors” is the name of the variety, and the colors are amazing! Several colors and combinations of colors appear on the same plant. A lot of the flowers almost look painted, with one half being yellow and the other bright pink with splashes of white (or one of several other combinations of different colors). Each flower is unique in pattern. There is also a solid white in this variety, and I save those seeds separately to grow in my night garden, where most flowers are white. Tammy, you are correct. Because unlike tomatoes, we actually eat the seeds of the corn and they do change on this years plants. That’s why is so hard to get a good sweet corn crop in corn country. All that field corn pollen blows in and viola, your corn tastes starchy and tough, just like field corn. Every couple years, I grow cushaw squash. I plant the same seeds I saved from the 80’s. They germinate just fine and are great for pies. The most important thing to know with hybrid seeds is that most, the vast majority, are odd-number polyploids – they are rarely capable of producing viable seeds. Some consideration should be given to what is a hybrid plant. The short answer is that they all are. People have been genetically manipulating food plants for thousands of years. (Don’t believe me? Google search “potato” and look at the varieties and check out what the first plants from South America produced.) Now it is done in the laboratory by gene splicing. A different way than field selecting plants for desirable traits. An example of field selected trait is the Rutgers tomato. What was wanted was a tomato that shipped well. The older tomatoes had a great deal of pulp and high shipping loss. Rutgers University, over 50 years ago, selected for less pulp and more meat. This tomato shipped well. Some will recognize the cultivars that came from this tomato. Big Boy, Better Boy, Big Girl, and so on. What was lost was the flavor. So now we select to bring back the flavor. Everything we know as a food crop has been manipulated for one or more traits, like disease resistance, drought resistance, fruit size, flavor and more. I believe what we need is a variety of seeds for each food crop we want. One may grow, while others fail. You can find an example of the mono-cropping failure in the Irish potato famine. They grew only a cultivar called the “Lumper”. When this potato was effected by disease, they had no other species of potato to fall back to. So in this instance, VARIETY is the spice of life. You are correct longtooth, good info. First, I am wondering if I am completely screwed since I am pretty much just beginning my preparedness. I know that no one really KNOWS when the S*** will HTF, but I think there are some pretty educated people here, so I would love to hear some theories. I feel in my gut from the tension in the world lately that something is coming for sure. We are a little tight on money, so I can only eek out so much from each of our pay checks to buy supplies beyond what we need now. I’m too embarrassed to tell you all how little we have – not much. I think the mindset and having even started at all puts me ahead of some people, but when it comes down to it, money talks. Guess I should have saved more and traveled less – naw, who am I kidding, I have travel fever. Also, who would like to recommend the best heirloom brands of seeds that I can shop for on the web? As far as the timing–I’d say don’t worry about it. Just keep working at your preparations, and it will come when it comes. The important thing is that you’ve started. That puts you miles ahead of most people. If you have two weeks or a month of stored food and water, that means you don’t need to endanger yourself gathering more if there’s a riot or other disturbance. If there’s an epidemic, you and your family are safe. If there’s some kind of natural disaster, you have what you need. If you have three months, congratulations you’ve just survived your first winter post SHTF. None of use feel adequately prepared, and we were all once exactly where you are. Just keep working at it. NOOOO!!!! !, let me repeat that a few times… No NO NO, you are NOT “completely screwed” because your just beginning your preparedness. I will guarantee you if you have even just a few things stored (including water) and a few skills, than you are better off than 95% of the other people around you…. Remember FEMA ask for 3 days’ worth of supplies, when is the last time a disaster only lasted 3 days???? I tell people all the time… “Use one, buy two” is a great way to build your supplies, secondly, “store what you eat, and eat what you store”…. As far as Seeds, I like Rareseeds, dot, com they have a HUGE selection of seeds.